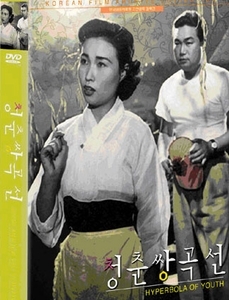 In the past two years, the Korean Film Archive has been gradually releasing early Korean cinema classics on DVD. Of the half dozen films released so far, the KOFA has focused most of its efforts on the works of 50s Chungmuro pioneer Han Hyung Mo. He was cinematographer for the collection's first title, Hurrah For Freedom, one of the most important Korean films of the 1940s, and his films The Hand of Fate and Madam Freedom were both released last year. Now the latest film to emerge from the archive is Han's Hyperbola of Youth. Hyperbola of Youth stands out as one of the first Korean cinema attempts in the musical comedy genre, and definitely the first after the Korean War. It features several famous classic songs like Nights of Shilla. The film tells the story of two high school classmates who grow up following different roads, one becoming the head of a very rich family, the other a very poor man. One fateful day, the two fall ill and find themselves in the same hospital, and the doctor solves their problems in an eclectic way: since one got ill for eating too much and the other too little, he proposes they exchange roles for a while. Despite the almost surreal situation, the two start getting used to their new life, and even develop feelings for the people they meet.